"As you ramble through life Brother, whatever be your goal, keep your eye upon the donut and not upon the hole"
For today's nut I would like to offer you up several bits of donut wisdom which, like the Optimists Creed, speaks not only to how we should try to face life each day, but even better how we can use donuts to face life and bring out our own inner donut. Think of this as "Donut Chi" if you will and thank God, or whatever you believe in, that we figure out the grand mystery of mating sugar, dough, and deliciousness. 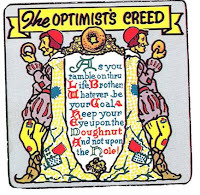 Optimist : Sees the doughnut, not the hole. 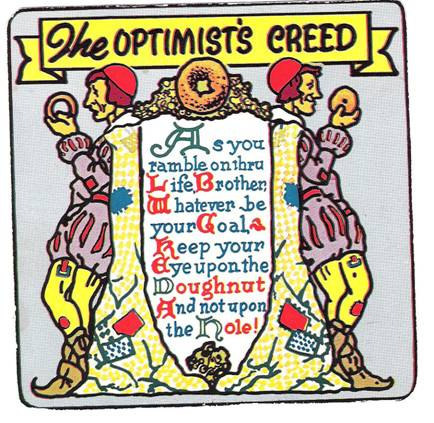 Pessimist : Sees the hole, not the doughnut. Realist : Sees both the doughnut and the hole. Diplomat : Talks through the hole. Dreamer : Only cares for the icing on the doughnut. Businessman : One who sells you the doughnut. Successful Businessman : One who takes the money, making you think that you already have the doughnut. Very Successful Businessman : Makes you pay for the hole too. Capitalism : You buy a doughnut. Socialism : The State gives you a doughnut. Communism : The State sells you a doughnut. Marxism : The State takes your doughnut away and gives it to someone who hasn't got a doughnut. Stalinism : The State takes your doughnut away, eats it, and tells you that they gave it to someone who hadn't got a doughnut. Bureaucracy : The State takes your doughnut away and then refuses to let you buy another doughnut because you already have one. Fascism : The Storm-troopers eat your doughnut and shoot you. Dictatorship : Buy a doughnut, or else. Church of England : You know, in a very real sense, God is a doughnut. Buddhism : God is a doughnut, and God is not a doughnut. Confucianism : Confucius he say doughnut. Zen : What is the sound of one doughnut clapping? Catholicism : The priest blesses the doughnut and you mustn't chew it. Christianity : I was hungry, and ye gave me a doughnut. Fundamentalism : Doughnuts are an abomination unto the Lord, etc. No matter what type of donut or doughnut you are, and how you see the world through your nut, just remember it's the donuts that bind all together; in laughter, in sadness, in joy and indigestion. Give a man a doughnut, he eats for a day. Teach a man to drive to the local doughnut shop, he eats for a lifetime!